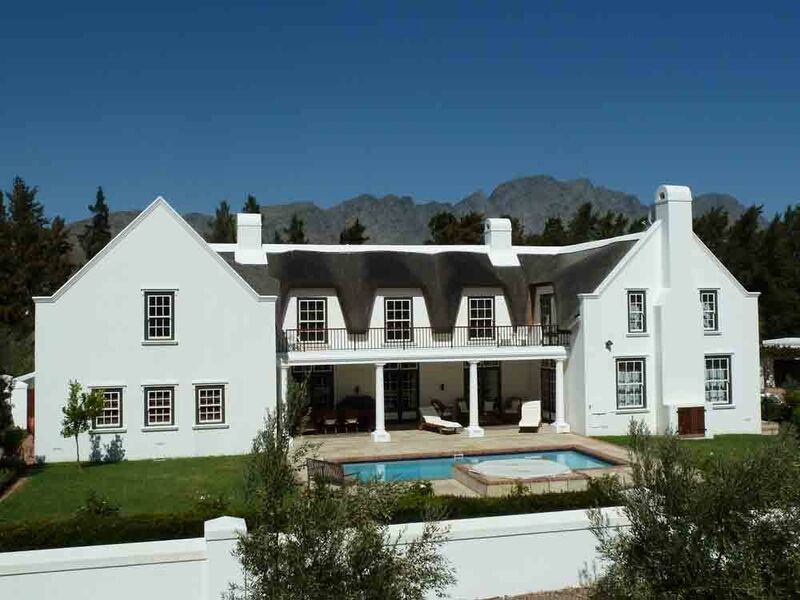 You will enjoy living on a sizeable stoep (patio) shielded from the occasional Franschhoek winds. Three bedrooms, all en-suite, with a gym and cinema room which can be turned into occasional bedrooms, should guests increase in number. There is a fully equiped study/library with broadband connection, scullery, walk in cold room, swimming pool, jacuzzi, steam room and satelite TV. A large walk in wine cellar sits benieth the house and all new guests are welcomed with a bottle of our vineyards wine. To make your stay as enjoyable a possible a houskeeper is provided during the working week. The large rooms provide you with a wonderful feeling of space echoing what Africa has to offer. The house has been designed with much love and affection and represents the owners living experience throughout Africa, from the Cape to Cairo, and incoporates unique Cape Dutch architecture with a French Huguenot flavour. Housekeeper included during the working week: The housekeeper will clean house, make beds and do your washing at no extra charge. All bathroom are en-suite and well appointed with travetine tiling. Great property, great owners... recommended! We stayed about 3 weeks and had a great time. Robert is as owner very responsive which is really an added value. Also the housekeepster was a joy. The property itself is lovely! Everything you need is present. We can recommend this property to anyone. A group of us stayed here at the end of October 2008. The property is amazing, having been built with such attention to detail and with great thought. The rooms are all extremely spacious and the outside dining area offers a welcome place to sit, enjoy the views and sip the local wine. The maid prepared our beds, cleaned, tidied and was more than happy to go the extra mile in ensuring that our stay was as comfortable as possible. If you are staying in the Franschooek area, this is a must! It is a great location surrounmded by wonderful scenery and vineyards. We can't wait to return to SA or to stay here again. Franschhoek (French Corner) is where the French Huguenots settled in 1689; it is considered the gourmet and wine capital of South Africa and is set in a a unique valley that is almost surrounded by wonderful mountains. It is the most visited village in South Africa. Stellenbosch, the second oldest city in South Africa, is a 20 minute drive away with its wonderful history, architecture, and relaxed shopping and this scenic drive is not to be missed. Cape Town is an hours motorway drive away and offers the visitor Table Mountain, a trip to Robben Island, great shopping, Parliament House, the Old Fort, and the wonderful V & A Marina and shopping centre where one can watch seals over a wonderful lunch and glass of Chardonnay. If one wants to venture further afield one can tour the Cape of Good Hope penninsula and take a swim with the penguins at Boulders Beach. Go to Google Earth and enter 33deg54'15.23'S, 19deg06148.56'E to see the actual property and location.